The New York City Dept. of Health and Mental Hygiene (DOHMH) sprayed the dangerous pesticide “Anvil” in sections of Brooklyn last month and continues to fog Staten Island, purportedly to kill mosquitoes which may or may not be carrying West Nile virus. City officials also ordered spraying in Queens and the Bronx. The first spraying of the year in Brooklyn took place on the evening of August 21. The spray truck – now driven by unionized NYC workers wearing DOHMH insignias – recklessly spewed pesticides in a thick cloud down crowded 5th Avenue in Sunset Park and in the surrounding area in utter disregard of the hundreds of people walking the streets. The truck blasted pregnant women and many, many little children with the spray, and fogged people in dozens of restaurants – their doors wide open – without warning as they ate. This year, City officials have put forth even less information than in the past as to why they decide to spray pesticides. In addition, they have started spraying earlier in the evening, even though people are more likely to be on the streets and directly affected by the spraying. The NoSpray Coalition learned about the plan to spray in Brooklyn earlier that same day and set up a literature table near at the “F” train exit on the corner of McDonald Avenue and Albemarle Rd. in the residential Kensington section shortly before the spraying began. Around a dozen participants distributed hundreds of flyers, spoke with local store owners, and held a Speak-Out right there on the corner. As public awareness grows, people have begun taking to the streets. In recent months, protests against pesticides have taken place in Winnipeg (Canada), Chicago, Florida, St. Louis, and California. Why does the City continue to pursue this senseless way of killing mosquitoes? Indeed, the so-called pesticide ’cure’ jeopardizes many, many more people than West Nile virus is said to do, as well as pets, bees, butterflies, fish and the natural environment. There are numerous effective ways to repel mosquitoes – poisoning us all is not one of them. The No Spray Coalition has called for people throughout the City to protest the spraying, Some may block the spray trucks. Others may do theater, write to their local government officials, hand out flyers in their neighborhoods and schools, or take other actions deemed necessary to save our lives from the dangerous sprays the City is using. The Coalition has also contacted the drivers’ union, as spray truck drivers a few years ago were diagnosed at Mt. Sinai hospital with serious ailments due to pesticide poisoning. 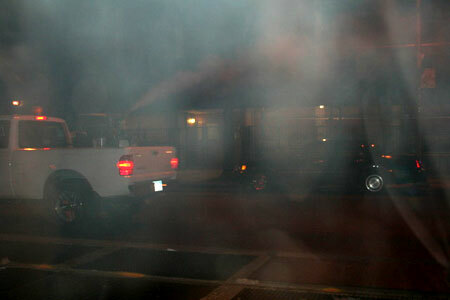 Additional photos from this spraying of people on Brooklyn streets can be seen here. 1. Salam, et al: “Early-life environmental risk factors for asthma findings from the children’s health study.” Environmental Health Perspectives 112(6):760-765. 2. Pesticides have cumulative, multigenerational, degenerative impacts on human health, especially on the development of children which may not be evident immediately and may only appear years or even decades later. Moulton, Patricia, et al: Chronic Exposure to Pesticides and Intellectual Performance in Children, American Psychological Association Annual Conference, New Orleans, Louisiana, Aug. 13, 2006. Ambient Air Pollution: Respiratory Hazards to Children, Pediatrics 91, 1993. 3. Studies done in New York state for mosquitoes carrying Eastern Equine Encephalitis found a 15-fold increase in mosquitoes after repeated spraying, and virtually all of the new generations of mosquitoes were pesticide-resistant. Journal of the Am Mosquito Control Assoc, Dec; 13(4):315-25, 1997 Howard JJ, Oliver New York State Department of Health, SUNY-College ESF, Syracuse 13210. 4. “Efficacy of Resmethrin Aerosols Applied from the Road for Suppressing Culex Vectors of West Nile Virus,” Michael R. Reddy, Department of Immunology and Infectious Diseases, Harvard School of Public Health, Boston, Massachusetts, et. al., Vector-Borne and Zoonotic Diseases, Volume 6, Number 2, June 2006. The No Spray Coalition is an all-volunteer not-for-profit organization that formed seven years ago to oppose New York City’s mass-spraying of Malathion and Pyrethroids by helicopter and truck. Since that time, the Coalition has grown substantially by working alongside other environmental justice organizations and individuals and supporting each others’ work. As a result, anti-pesticides activities have increased throughout the continent. The No Spray Coalition, along with other activist groups, has become expert in the dangers of pesticides and in presenting alternative and non-toxic means for dealing with mosquitoes and other critters considered to be pests. In 2000, the No Spray Coalition became the lead plaintiff in a lawsuit against New York City. Other plaintiffs include the National Coalition Against the Misuse of Pesticides (Beyond Pesticides), Disabled In Action, Save Organic Standards – NY, Valerie Sheppard (in Memoriam), Mitchel Cohen, Robert Lederman, and Eva Yaa Asantewaa. Last year, Federal District Judge Daniels upheld, for the most part, the No Spray Coalition’s interpretation of the Clean Water Act. The trial was set to go forward solely on the question of whether or not the City sprayed over navigable waterways. Since that time, the Coalition and the NYC government have become engaged in some rather intense rounds of negotiations in an attempt to reach a settlement. Why negotiate instead of going to trial? The advantage for NYC is obvious — to avoid risking a “guilty” verdict finding that they sprayed over navigable waterways and broke the law. While the NoSpray Coalition has amassed a great deal of testimony and video clips that this was indeed the case, we believe that there are substantial advantages at this time for opponents of pesticide spraying to try to arrive at a settlement, so long as it contains language expressing a clear recognition of the dangers of pesticides and stipulates ecological remediation. These, we feel, would be an important advance over what we might win at trial should the City be found guilty of violating the law. We were in the midst of finalizing a possible settlement when the City began this latest and horrible round of pesticide spraying. We still hold out hope that we will be able to reach a negotiated settlement, but the reckless spraying that the City is currently doing indicates to us that officials have not learned the lessons that even many of its own public health officials had outlined. As an all-volunteer group — none of us gets paid — the NoSpray Coalition depends on the consciousness and generosity of our supporters. Funds are desperately needed. Whatever you can contribute would be very helpful.